This is an excerpt from an internal newsletter. I loved the photo of the chefs who recently took the Pro Chef II examination. Congratulations to John Adams and Simon Lewis from The Ahwahnee, Jessica Barnes from Great American Ballpark, Chris Tunnell from Choctaw Casino Resort, Richard Mathis from St. Pete Times Forum, Steven Sterritt from Geneva State Park and Will Cunneen from Red Bull Arena. 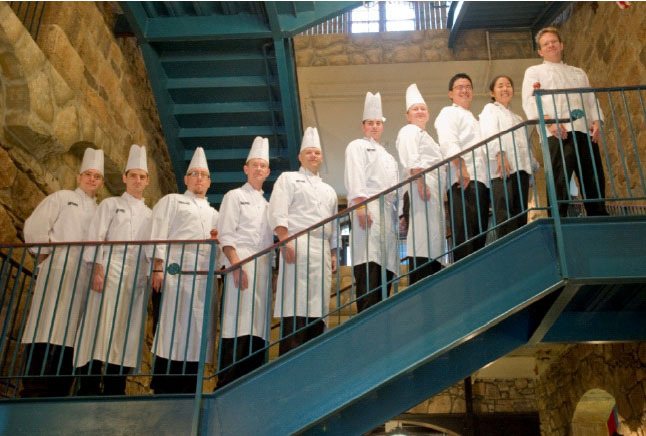 Each worked with great intensity at The Culinary Institute of America at Greystone to earn their Pro Chef 2 Certification. During four incredible days, our chefs took practical tests in baking, healthy cooking, Mediterranean cuisine and Garde Manger. They took written tests in the same disciplines as well as in finance and supervisory development. They learned the importance of having a well-developed plan and sticking to it. This is the first Delaware North group who used the new Viking kitchen that was recently inaugurated at Greystone. What a treat to have all the equipment you can imagine readily available. The group was under the supervision of Chef Toni Sakaguchi, who has worked with Delaware North chefs for the past three years, Chef Thomas Wong and Chef Scott Conant, who all provided many practical tips. Once again our chefs were well prepared. Thanks to Chef Roland who spent time with each participant for a week offering training and going through trial runs. In the past, chefs taking the PC2 were automatically granted the Certified Chef de Cuisine certification from the American Culinary Federation. However, the accreditation agreement between the ACF and the CIA was recently changed and our chefs will need to take one additional test and present their employment history to the ACF before earning their CCC. This entry was posted on Friday, December 17th, 2010 at 4:20 pm and is filed under Uncategorized. You can follow any responses to this entry through the RSS 2.0 feed. You can leave a response, or trackback from your own site.